Google play IAP Question — Welcome to the GameSalad forum! I am trying to use consumable item in Google Play. 1st time everything is OK, but after this user gets the item again and again. It's like the value in Purchase table is all the time "purchased", like the behaviour In App Purchase - Consume Item doesn't work. Do you definitely have "is purchased" rather than "contains purchased"? That's often a cause of repeated reward triggers. Thanks @Armelline for your answer. Yes it's "is"
I'll need to see all the purchase logic then if we're to have any hope of pinning this down. That looks fairly straightforward, and should be working. If the add coins is triggering, the consume should be triggering too. The "pc" is typed directly into the box, not into the Expression Editor? Add coins is triggering and "pc" is typed directly into the box, not into the Expression Editor. Double checked this. Next thing I'd do would be throw a display text or spawn into the timer along with the consume, and check that that timer is actually being run. Could still be lots of things though. Thanks for the tip @Armelline. Tried with display text and and different timer values. 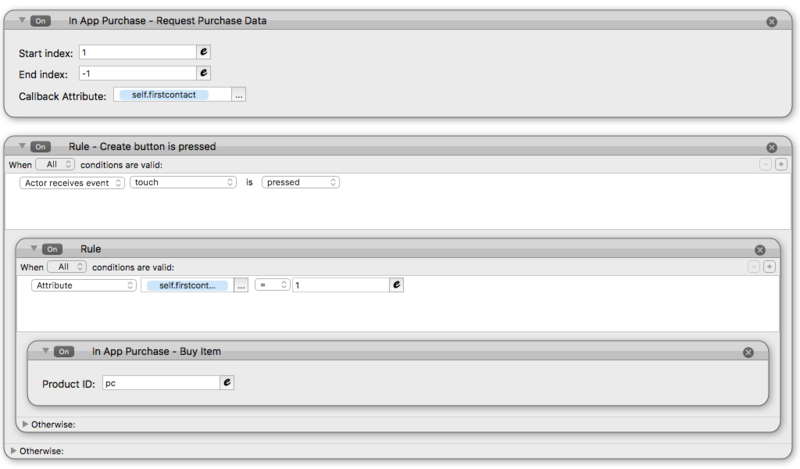 Display text fires right after the consume, but the State column in the PurchaseTable stays purchased. To clarify, all this happens in Android version (Google Alpha release). Everything else works: In App Purchase Request Purchase Data fetches the local prices, players can buy it with test purchases or with real money. 1st purchase is OK, but since the In App Purchase Consume Item doesn't chance the status to unpurchased players can't buy again. After spending hundreds of working hours to this game, I really hope that this is not a dead-end. Do you definitely have the banking info and contacts all filled out correctly? yes, banking and contacts are filled correctly. I "fixed" this with quite ugly hack: I changed the consumable item to non-consumable, but it appears to user as consumable. i.e. user can buy the item endlessly it just uses always a new non-consumable item.